A legend on the diamond and in the collecting world, there's been nobody like Mickey Mantle. 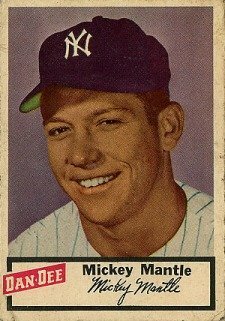 With literally thousands of cards to choose from, here are the top ten Mickey Mantle baseball cards of all-time. 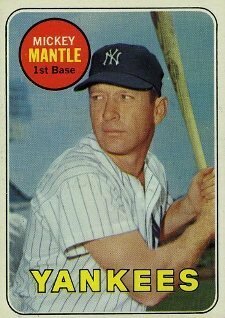 The most iconic post-War card in existence, people often regard Mantle's 1952 Topps Baseball card his rookie. It's not. But from a hobby standpoint, it's easily his most important piece of cardboard. Added to the much rarer "high series," legend has it that cases of leftover product were sent to a watery grave at the bottom of the ocean by Topps founder, Sy Berger. Issued a year before his Topps debut, Mantle's true rookie card comes from 1951 Bowman Baseball. The painted image features a young Mantle standing against a cloudy backdrop. It's a beautiful card that embodies classic baseball card collecting. 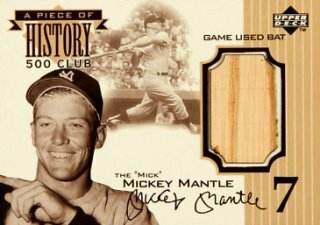 Like the 1952 Topps issue, this iconic Mickey Mantle baseball card was part of the scarcer high series, adding to its scarcity ,and subsequently, its value. 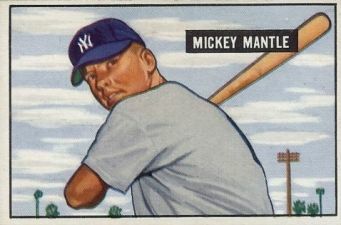 Another beautifully painted card, Mantle's 1952 Bowman Baseball card is the first mainstream card to picture him in the classic Yankee pinstripes. Like Mantle's 1952 Topps card, Bowman also included facsimile autographs. Mantle's second Topps issue offers a close-up look at the young slugger. This is also the last Topps card Mantle had for a couple of years, as he would not return to the company until 1956. Although it might get a lot of attention for being on of the earliest baseball card sets from the company, 1953 Topps Baseball stands out on its own for having one of the best designs of all-time. If Mantle embodies the vintage appeal of the hobby, Ken Griffey Jr. is the king of modern baseball cards. Autographed cards were still a rare novelty in 1994. Dual signatures were even tougher to come by. Upper Deck seeded 1,000 of these painted cards featuring autographs from both hobby icons in retail packs of 1994 Upper Deck Series 1 Baseball. Single-signed versions were also included. Upper Deck's Piece of History - 500 Club is one of the few memorabilia sets to reach iconic status in the hobby. Even though bat slivers are generally regarded as being less desirable than a nice jersey or patch swatch, these cards that honor the game's biggest sluggers have held up on the secondary market extremely well. Released over various sets and years, Mantle's Piece of History card was inserted in 1999 Upper Deck Ovation Baseball. It also holds the distinction of being the slugger's first game-used memorabilia card. Limited to 350 copies, there's also a one-of-one version that also has a cut signature. 1969 Topps Baseball marked the last release to feature the Yankees legend during his playing days. The look in his eyes tell the story of a weary veteran who lived as hard as he played. It's a contrasting view of his earlier cards that often featured a beaming smile. Who would've guessed a card from 1992 Score Baseball would land in Mantle's top ten? 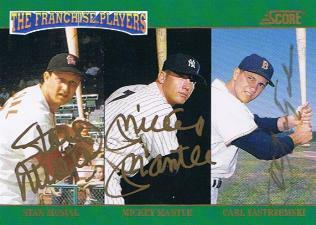 But who wouldn't want a card that has Mantle's signature sandwiched between those of Stan Musial and Carl Yastrzemski? The gold ink is also a nice addition. A total of 500 of these triple autographs were produced. Considering the massive print run that 1992 Score had, good luck finding one. Think athlete exclusives on trading cards are a new thing? Think again. Back in 1954, Mickey Mantle (along with Roy Campanella and Pee Wee Reese) signed to appear exclusively in Bowman products. The 1954 Bowman Baseball design is simple but beautiful. 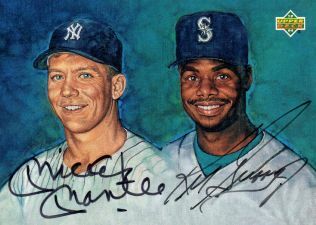 A painted portrait of Mantle is anchored by a solid green box with a facsimile autograph. Mickey Mantle knew he was one of the best in the game. Perhaps no other card shows his confidence than this early oddball release from Dan-Dee Potato Chips. 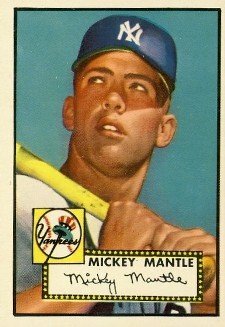 It's also notable because, up to this point, Mantle's mainstream releases from Topps and Bowman all featured painted portraits and not photographs like the ones used here. Due to their distribution with the greasy snacks, it's extremely difficult to find cards without stains. Please note that although very valuable, individual cut signature and one-of-one cards were left off due to their scarcity. 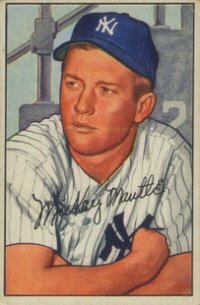 Did your favorite Mickey Mantle baseball card make our list? Let us know which ones stand out to you in the comments below. 1 1 GENUINE DIAMOND Joe Dimaggio 2018 Flawless PANINI SEALED #'D 1 1 XL Diamond! Hi. I have 2 Upper Deck – MICKEY MANTLE cards that are numbered. Any idea of worth? There are several that fit that description. If you’re able to email a scan to rcracknell@cardboardconnection.com I can help you better. I have a Mickey Mantle card it’s his 500th Home run #44. It’s from the Mickey Mantle collection. It’s a 1997Mickey Mantle properties. Can you please tell me how much this card it worth? The 1962 is better looking than any on the list, I think it should be as high as #4. I have a No 5 Post card that is one sided which has his 1961 and Life stats on it. Is this card worth any value. Thankyou for your time. I AM LOOKING TOO BUY A 1952 MICKEY MANTLE BASEBALL CARD SO PLEASE LET ME NO WHO IS SELLING THE REAL CARD..
Hello my bame is Alex O.I am offering to sell my Mickey Mantle 1931-1951 23kg. Baseball card.It`s in good condition if you want more informatin about it email at barronl2013@gmail.com or akexortiz51013@gmail.com.Or if you can give me any information on where to sell it at I would really be thankful.Thank you Alex O.
I have a 1969 Mickey Mantle Topps card (with no Topps designation). Mickey Mantle is written in white, and Yankees is in yellow. There is a slight crease in the card. What is the expected card value? Good list but for my taste nothing compares to the 1953 Bowman Color Mantle #59. It is a phenomenal card with a youthful Mantle posing after a swing with Yankee Stadium in the backdrop. A timeless classic! Peter � Two different PSA 8 versions sold for around $6,000-$6,500 in the last few months. I have a Topps mm64 mentioning Mick’s help with bat and glove to aid Larson’s perfect game. At bottome, it gives his 1956 season stats and career to date stats. Any idea as to worth? I have never owned the 52 topps but have had all of the rest of his big cards. I love the 51 Bowman and the 53 Topps but after that I feel like the 56 Topps is my favorite! That thing is so beautiful and I was a little surprised it didn’t make the list. Where does the 56 land on your list? Hi, Im looking to sell a 1965 #3 League Leaders Mickey Mantle card graded BVG9.. I have a 1956 mantle graded an 8.5 by beckett and I want to know how much it is worth. I have a 1999 tops mickey mantle 1953 insert card and can’t find the value. Also a hand crafted bone rubbed autographed in gold Raul Ibanaze bat. And can’t find the value. I know its not a cards but last week, i got a large sports collection. In the collection, the man had a box full of very old genuine printing plates of different sports. The Baseball plates are so nice..Larry Doby, Roy Campanella, Sox Rivera & Connie Johnson….. But i found 2 that are nicer…. I have a Mickey Mantle card that had a orange border and he is in NY uniform. Stats on back but no numbers or type of card fleet,upper deck,etc???? I’m lost can anyone help with year and maker? I have a few of these Mickey Mantle cards in good condition- Rookie of the week 1 of 25; printed by TOPPS. But the edition is 2006. I have a few Hall of Famer cards of Mantle and other Hall of Famers, but printed in the 2000s. What value do they have ? Mickey Mantle ? Ernie Banks ? Willie Mays ? Nolan Ryan ? Mike Schmidt ? 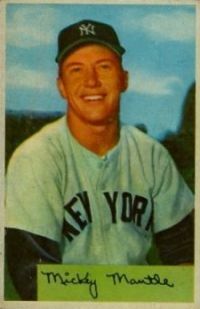 I have a mickey mantle baseball card its a reprint i think dont know much about them was wonderin if worth anything. I have a book of baseball cards all different kinds some are realy old. Just wanted to know if anyone was inttested in any of them. Hi, I have several old and somewhat new baseball cards. I need someone to contact me to check on the prices. I have Babe Ruth, Mickey Mantle, Ty Cobbs, Jackie Robinson, Willie Mays and that’s just to name a few. I have rookie cards also. I have a Mickey Mantke signed baseball but in the years it lost so much ink you can barely make out the name anymore. Is this signed ball worthless or worth anything? My grandfather has a set of every Topps Mickey Mantle card that he wants to sell before he passes away. Getting them graded seems really expensive. Do he need to get them graded to make sure he gets the best value? If interested in buying, feel free to reach out and i can send photos. 1ST Base Yankee card, what is the value? I have a old a& p silver autograph Mickey Mantle card that got signed in new York City at a a& p store where he would go a sign cards. The card is black and white. With Mickey running around the bases and a umpire all dressed in black in the background. We have searched for years and have never seen another like it. Just might be willing to sell if price is right. 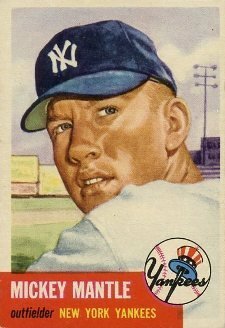 Every time I hold the 1952 Topps Mickey Mantle in my hand, I still get goose bumps! I think the ’53 Topps is gorgeous as well (especially if those edges in red aren’t dinged)! One classic that is very underrated, yet beautiful is the 1954 Red Heart Dog Food Mantle. I also really like the 1969 Topps White Letter Mickey Mantle. Many folks don’t realize that this is a very rare variation and Mickey has very few variations.